I spent a day this week with just my 4 younger children. Joshua and Ruth had gone to a nearby farm to help with their animals and to have riding lessons. I had to drop them off. Leaving the younger 4 by themselves is a disastrous proposition not even worthy of consideration. (Okay, I admit I enjoyed putting that many big words into one simple sentence.) In other words I’m not leaving the little kids by themselves for even a minute. I got them all up and the older children ate breakfast while the younger ones were scrounging around for their shoes. We dropped their big brother and sister off for their riding lessons and I took the younger ones to a local store for honey buns and hot chocolate mix. That was a fancy breakfast in their minds. 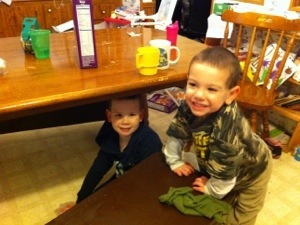 After breakfast I decided to let them have a little free time while I worked on some lesson plans. Jonathan and Hannah were pretty creative. Hannah made herself a mop lady and Jonathan a broom man. 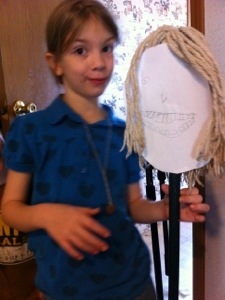 Hannah named her new friend Jennifer. 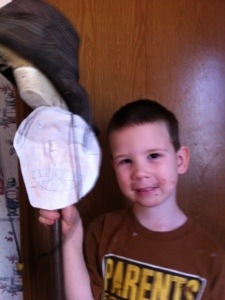 Jonathan said his was grandpa with a Mohawk and a cowboy hat. Elijah has been working on potty training. I have also been having to teach him not to be rough with Elisabeth. In the above picture of Elijah and Elisabeth they are playing on our kitchen floor. I’ve been managing to keep the kitchen clean. I try hard to keep every dish washed up after each meal. Sometimes there are a few left to be done before bed but not nearly as many as there used to be. I have learned that there are a couple of things that help in being resolved to keep the kitchen clean. 1. You can’t expect anyone else to do it. 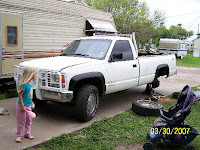 I can tell my children to help but unless I show that I care and put forth some effort myself then no one else will. 2. Be determined. I tell myself that I’m not going to bed until every dish is clean. If I want to get to bed at a reasonable time I have to keep those dishes up throughout the day or I’d be up all night doing dishes. That is true but unless you want those dishes to multiply into an embarrassing mess you better catch it while there is just a few. Otherwise you’re stuck playing catch up and believe me that is no fun. Keeping it up is much easier than catching it up. 4. Numbers don’t matter. Cleaning with 2 versus 6 kids? I’ve had only 2 kids before and now I have 6. I can actually speak from experience on this question. With 2 children you don’t have as many helpers. Of course, they don’t make as big a mess either. Technically clean up is about the same with both. With 6 kids there may be more dishes but you can assign them jobs that you would normally have to do if there were only 2 children. 5. Make it quality time. The same saying about the dishes not going anywhere is usually followed by “…but your children are only young once.” In other words, you should spend that time doing dishes and cleaning house with your children instead. Okay, I’ve followed that advice before. I actually liked it. I much preferred spending quality time playing with my children to housekeeping. That’s why I had a messy kitchen for the past 2+ years. I now have a new outlook on quality time. This year I’ve determined that I’d have even more quality time if the kids and I cleaned up the kitchen before we do other things. And who says cleaning the kitchen isn’t quality time? If you think about it we are all in the room together. Why not teach my kids a new song while we’re cleaning. Now with little ones particularly of the potty training years then I may have to leave the dishes for a moment to take care of an emergency. If it’s a 6 month old wanting to be held. 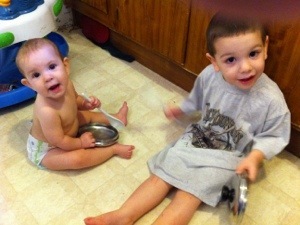 A clean floor with a pot lid and plastic spoon is a very fun toy. More fun than a brightly colored toy in fact. 6. Give the excess away. If I haven’t used a dish in over a year then I probably don’t need it. Give it away! Think of it as one less dish to wash. It’s also one more spot in the cabinet freed up for those dishes I do use. Do you have any advice on keeping the kitchen clean? Or do you have a housekeeping question that you’re struggling with? I’d love to hear from you. Tell me what you think. If you don’t want to miss any of my upcoming posts, please sign up for my free email updates. We are coming upon the end of our second week of 2013. Quite often you can know at the end of a month whether the goals you set were reasonable or not. I feel pretty good about our goals this year. One great thing is I’ve been meeting my goal of waking up earlier in the mornings. I’ll be posting more on that in future posts. Today I want to tell you about our housekeeping goals. I have a goal this year to never leave dishes in the sink. There were many nights in 2012 that I sighed and left the dishes to be done the next morning. That is because I had a chore assignment fail between 2011 and 2012. Yes, it was pretty sad. I have tried so many things these past couple of years with chores. We do pretty good when we’re in a good routine that works but when something breaks the routine sometimes it turns crazy. In 2011 we tried assigning each child monthly chores and paying them an allowance. That did not work! The problem I had with paying them an allowance was that they took so long to get the job done. Then if there was a dirty job they didn’t want to do, it wound up set aside for the next month’s switch. Which meant that just made that chore yuckier for the next child assigned to it. It was also hard to judge how much to pay our children because they preferred not working more than money. I also felt if I helped them by doing their assigned chore they were only learning that someone else will do it for them. It is a lot easier to maintain cleanliness than to catch up on it. This past year (2012) I had a hard time getting caught up. I felt I was constantly washing dishes. 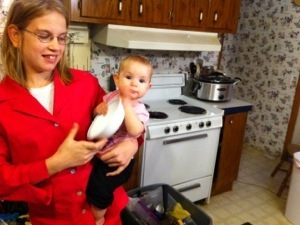 I’m faster at the dishes than the children and more thorough. 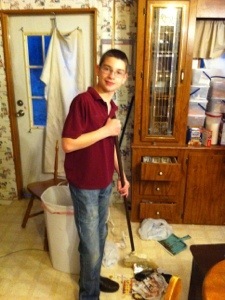 So I had my kids doing other odd jobs around the house or working on their lessons while I did dishes. My husband was very sweet and started trying to help me with dishes as well. He was seeing the effort I put toward getting things caught up around the house. Two weeks into the new year and things are going well. I’m determined that my goal of having a clean house is higher priority than even my writing goals. The clothes issue is another matter. We have too many clothes. We are given quite a bit of hand-me-down clothes which isn’t the problem. The problem is we’re not getting rid of the outgrown clothes quick enough. Then it becomes a mess because the kids don’t have a place to put it all. It gets left on their floor along with dirty clothes. Well, you can probably imagine how their rooms looked. Picture 6 kids in 2 small bedrooms. Scary! My husband had 2 weeks off during the Christmas break. One of those weeks he took and bagged up the trash and hidden toys in their rooms and kept the laundry running with clothes. I had the kids helping me sort through those clothes as soon as they came out of the dryer. We’re not finished with that project yet but basically I am having them pick only a certain number of clothes to keep. The rest we need to get rid of. So far besides what my husband has already taken away, I have two large garbage bags of clothes waiting in the van to be given away. My husband told them that he will be doing weekly checks on their rooms at random to ensure they keep them picked up. Anything he finds on their floor or out of place will be thrown away. He gave them a warning to look in their rooms yesterday and tell him what they would be losing if he were to check them right then. They had a few things they would have lost but I think they are taking him seriously. I have simplified our kitchen routine this year. We no longer leave the kitchen for one or two people to clean. I assigned the two younger boys to wipe the benches and the floor. (They tend to cause the most spills.) We don’t let those spills set around for someone else to clean up anymore. I assigned my 7 year old daughter the task of clearing and wiping the table. She can reach everything on the table and is able to put things where they go. 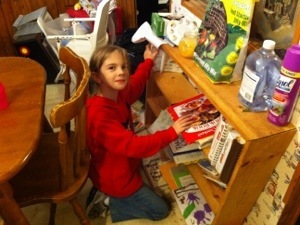 In the picture I also have her straightening the cookbook shelf. My 12 year old daughter is very good at organizing. I usually have her dry and put away the dishes that I wash.
And my 14 year old I usually have getting all the trash off the floor and sweeping. I’m not sure where all the trash comes from but there never seems to be an end to it getting on the floor. We don’t even use paper napkins. I’m not sure where it all comes from. That’s our new after-meal routine. I must say that so far it’s been working. I no longer have to stay up late doing dishes. Nor do I have to sigh and decide to leave the dishes for the next day. I found that by my being in the room washing the dishes while they do their tasks keeps them from getting distracted. We now get the kitchen completely cleaned in a matter of minutes. That is much better than the whole day it use to take. How about your home? Are there chores that your family struggles with? Do you have any housekeeping tips that might help us out? Please share in the comments section. Hopefully I’ll be having a success story about our laundry woes soon. Stay tuned by subscribing to my email updates. That way you won’t miss a single post. If you want to read some other Mommies perspectives on Thriving at home, check it out. Alright, alright, so it’s been 6 days since I posted! 🙂 So for my brother, I’ll try to catch up. This past weekend we visited a church in Oklahoma. We enjoyed our visit with them. They put us up in a real nice hotel with an in-door swimming pool. The kids really liked that. We let them stay up a little late Saturday night to swim. Jonathan was the only one who didn’t seem to like the water, but I think it’s mainly because he was tired and wanting to go to bed. Sunday, we stopped at a gas station on our way to church. The gas station wound up having a computer glitch and so he wound up charged twice but they wouldn’t be sure of it until they counted the till later that day. So Scott told them he would be back after church and they can give him his money back if he was over charged. Thankfully we made it to church before Sunday School started even though waiting on the computer took a while. The kids made a few friends at the church. We got to see a 9 month old baby, which got the kids dreaming of when Jonathan will be big enough to do that much. The church had what Scott and I call canned music. Their piano is played over the sound system off of a CD. We didn’t tell them that I played the piano at the beginning. We don’t like churches calling a pastor because of what his wife can do. Some churches may say they are seeking a pastor when they are actually seeking a piano player. I think more people should learn to play piano. I am going to have to get out my keyboard and start teaching my children how to play as well. They can play the Ukulele pretty well but I need to teach them the piano. I’ve never taught piano before but I figured it would be worth trying with my kids. It would be a good part of their education. Let’s see, what else is going on? Instead of blogging I need to be outside working on the trailer. After lunch I will probably start working on that again. I worked on it some yesterday but had to wait on some boxes. I now have the boxes and can finish the task. We are glad we have the trailer available to be used. We will be delivering it to it’s new temporary location at the end of this week. I have a lot of fond memories of that trailer. We lived in it for a year. Even though it was small, we were actually able to manage quite simply. The only problem I had was figuring out where to put our 4th child. From the experience of living in a trailer, I learned that a person can be content with little. Maybe we shouldn’t ever sell the trailer. We should keep it around and whenever I feel discontented, I should go out to that trailer and sit in there and remember what life was like that year. I need to occasionally remember all the trips to the laundry mat with 3 kids in tow. Laundry day back then was a once a week, all day event. I need to remember getting the kids to bed and hanging a curtain up to wash dishes, so I would not disturb the kids sleeping on pallets on the floor, while I was doing dishes. I need to remember the kids folding up their blankets and getting out their t.v. trays in order to do their lessons. I need to remember all of us sitting around that small table reading our Bibles as a family. I need to remember having to put thick curtains around the windows to keep in the heat from the heaters in the winter time. And the air from the air conditioners in the summer time. I need to remember the time our electricity completely quit on us on the coldest day of the year. I remember making bedrooms for us in the church, for a couple of days, while Scott got it running again with a little help from his boss who was a former electrician. I need to remember all those things and how much we learned from the experience. Now any house will seem big compared to that. I’m looking forward to the day that we are again in our own house, no matter the size it will seem big in comparison. God has definitely blessed us with always giving us a roof over our heads. Ok, I know that in my last post earlier today, I said I would put up pictures of the days accomplishments. I was kind of hoping for more to be accomplished. The wood was too wet. So Scott and the kids just cleared some of the trees and came back to the house around lunch time. Scott was good and wore out. I wish I could have helped more but he said there wasn’t much to do until the boards dry to build the floor joices. So we wait. I’m hoping that maybe more will be done next week. But there is more rain in the forecast for our area. I guess we’ll just have to wait and see. In the mean time I’ll try to wait patiently. I’m sure looking forward to having a home of our own. I don’t know what God has in store for our future, but I kind of hope it includes a home soon. Ok, I guess I have a lot of work to go on being patient and waiting. Which maybe why God has us here for now. I do know that once we finally have our own home, I’ll be so happy and will appreciate it even more. So I don’t know why the wood has to be so wet today, but I’m sure there is a reason. We are also still waiting to hear from churches that want my husband to come in view of a call. We have one appointment in February. So I don’t know if the Lord has a church for my husband or if we will build this house first. It’s times like this that I would like to see into the future at what it is to plan for. In the mean time I suppose I’ll just wait and try to keep working on our present living quarters until the Lord provides us a more comfortable arrangement. Hopefully I’ll post a little more encouraging news next time. Please keep praying for us and that God will provide us a home that we can really call our own. I’ll just keep on smiling knowing that eventually God will answer our prayers. Php 4:19 But my God shall supply all your need according to his riches in glory by Christ Jesus.